I have been thinking some time about the announcement nearly two weeks ago of the Blackboard acquisition of two Moodle Partners. My focus has been elsewhere so I have not had the chance to blog my thoughts until now. As most will know, for the past few months my focus was the organising of the Ireland & UK Moodlemoot which ran last week April 2nd-4th, and from feedback so far people were happy with it. It was the first event that I have run with my new business (http://www.lts.ie), so hence it was a big focus. But as that is now over, and moving into the wind-down phase I have the time to put my thoughts to paper so to speak. I admit that I was surprised by the move on a few levels. Firstly I was surprised that Blackboard would acquire any Moodle service provider at all, as I think many were. Up until then it did not fit within my understanding of their planned business model; however business focuses can change and plans have to adapt. When you have a core product like an LMS, the Value Added Services (VAS) is where the incremental profit can be coming from. And looking at it now, those behind Blackboard have certainly laid the foundations for this area with virtual classrooms and learning analytics. The acquisitions of WIMBA and Elluminate platforms for virtual classrooms demonstrated a good understanding that the LMS is one part of the ecosystem and they wanted to have other value-added services to augment the LMS service income. In some ways you can see this as the first move towards diversification of LMS service provision. When you have clearly good products (like Elluminate) which can work with many LMS, it makes sense to actively sell into all of the different LMS customers which is only made easier through supporting the multiple platforms. I have not seen a better collaborative whiteboard than the one in Elluminate (now Blackboard Collaborate), although it is just one aspect of the overall virtual classroom solution. Right now, I see Adobe Connect as being better for mass-delivery (for webinars/presentations) and there is a variety of solutions that can perform small class tutorials. The one I am watching in this regard is BigBlueButton. However, time will tell how this area plays out. The battle is still ongoing. Also Blackboard have made good inroads with the analytics side of learning and if they can make this work for Blackboard why can it not also work for Moodle, and other systems. Analytics is going to be one of the service battlegrounds in coming years. Stats are king. So limiting the market for a good learning stats focused application does not make sense in the grand scheme of things. When I worked with Enovation Solutions they used Jasper Reports to build BI reports for Moodle. These were kind of cool and the power of an external tool analysing Moodle was clearly one way forward. I have also seen the great reporting that is possible with Moodle when you enhance it with a system like ELIS (from Remote-Learner when I worked there), these reports were compelling. Joule from Moodlerooms also had enhanced reporting. So it is clear that reporting is being pushed as a priority. The two community contributed modules in Moodle which can enhance reports are configurable reports and the Ad Hoc SQL reports, both of which enable report design however within the confines of Moodle database structure. So if I was a betting man, I would expect a version of Blackboard analytics to be available within Moodle in Joule soon, and perhaps even a community block released. So if these are some of the business reasons behind the push to support multiple platforms, what is the impact on Moodle the product and Moodle the community? Well, to understand the potential impact one has to look at what Moodle is but before that let me add a quote. Moodle itself has not, and will not, be purchased by anyone. I am committed to keeping it independent with exactly the same model it has now. I think it’s prudent to wait and see how it works out. There are a lot of strong Moodle supporters involved inside Moodlerooms and Netspot, and they all have the best of intentions towards the software and the community. This is very important and his comments lay the groundwork for my thoughts. So what is the risk to the software itself? Well, not a lot, or at least this change of ownership of two Moodle service providers has no major change or any risks that I can see. Moodlerooms already had a version of Moodle so to speak, with the Joule system as they had wrapped extra functionality around it but as they only hosted Joule and did not distribute it some of those features are not publicly available. That said, they have released a number of of their changes to the community over the years including flexpage, googleapps integration and other code directly into HQ. Moodlerooms contributed the IMS LTI consumer (External Tool) and the IMS Common Cartridge import and export for Moodle 2 both of which are great additions and Netspot are currently working on the re-development of the Assignment for Moodle 2.3. 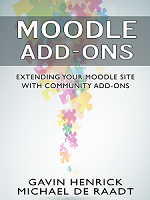 There was also another corporate distribution of Moodle, and some open source enhancements such as ELIS from Remote-Learner, but core Moodle still exists and grows stronger with more features and, most importantly, more integrations with other systems. I firmly believe that Moodle, as with all LMS, is one part of the full learning eco-system. In this light Moodle 2 having out-of-the-box integrations with Flickr and a wide range of other systems is the road forward – this is where things in general are moving especially considering the future impact as IMS LTI becomes widespread. There is a large number of contributors to the Moodle code base as can be seen here â€“ > http://moodle.org/dev/ So from where I sit, there is no increased risk for Moodle code base from the acquisition of the two Moodle Partners. Although a lot of the community interaction happens in the Moodle HQ provided forums, ticket system (tracker), Documentation Wiki (Moodle Docs ) there is also a lot of interaction elsewhere including Moodle User Groups, Moodle support e-mail lists, support blogs, help videos on Youtube and other systems, Twitter, Google+, Events like Moodlemoots or Moodle streams in other conferences. It is global and it is growing quickly. Last week’s Ireland & UK Moodlemoot showed the strength and depth of the collaboration and sharing that is going on and will continue to grow. One thing that struck me was that although the numbers from specific institutions may have dropped, that overall more institutions were attending the Moot for the first time. That is a strong and healthy eco-system I think. So of the community itself, two of those service providers now have a new boss and a different direction perhaps, but at least from what we have read so far, the intention is still there to keep them as part of the community which bodes well. Will this still be the case in 2 years? Who knows, but knowing some of the people involved in both companies, they are good people so as it stands I am not worried yet. So what about Moodle HQ? Having worked for two Moodle partners, I understand how the partner system helps funds Moodle HQ. I know it has been explained it in presentations at Moots and in forum posts but I do find that when talking to people in the community they are not always as aware of the details. It is no secret that Moodle partners give part of their revenue to help fund Moodle HQ and that this money in addition to the donations Moodle HQ receives directly is what gives HQ the income to employ the developers and staff in HQ to work on Moodle fulltime. As for your other question, no, Moodle Partners are not required to contribute to Moodle in any other way than by their 10% royalty payments. However, the bigger partners all do additionally contribute to the code in some way (either by coding, or bug fixing, or specification development, etc), because they want to be (and also to be seen to be) a true part of the open source community. It’s about respect. Likewise, their clients often have particular concerns (eg bugs) that need addressing, and we (Moodle HQ) prioritise those concerns. It’s a very symbiotic relationship of goodwill and co-operation. And everybody in the world gets to use the resulting software for free. The Moodle partner network is one of the things which differentiates Moodle from other open source applications in providing it a strong continuous income to push the product further and further, improving it, supporting it, bug fixing it and so on. The revenue stream from the partner network, along with the depth of the community certainly are two of the pillars on which the success has been built. What is the risk for HQ with the two service providers being purchased? Well, my understanding from the public statements is that they are still Moodle partners so will continue to contribute under that mechanism. Over the last few years, the partner network has been expanding and is currently 50 strong so that will help provide more security over time. From where I stand it looks like the code, the community and HQ are in a strong position for the coming years.